Expert analysis of current legal and policy developments on insurance coverage. Screenshot of the new Insurance Coverage Law Center website. 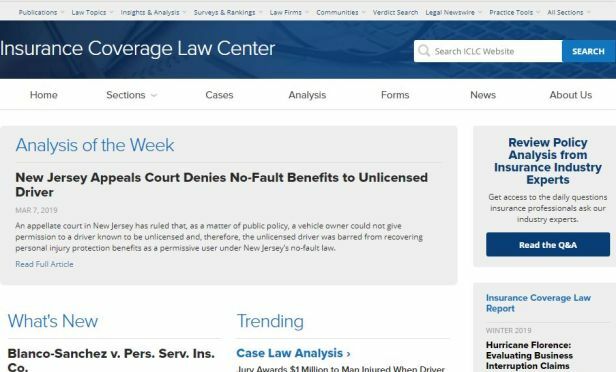 ALM, owner of PropertyCasualty360.com, announced today the release of the Insurance Coverage Law Center (ICLC), onto its cornerstone legal platform — Law.com. ICLC is an insurance coverage litigation solution that delivers daily expert analysis and tools to help insurance professionals and law firms address recurring and complex client issues. Coverage Q&A: Insurance liability questions arise after one state objects to policy exclusion language due to the opioid epidemic.